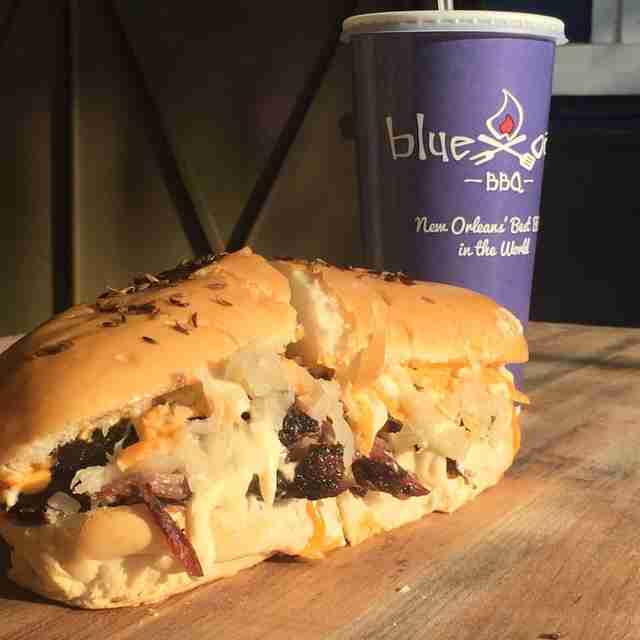 Get out your stretchy pants; it’s time to chow down on New Orleans’ best po-boys. 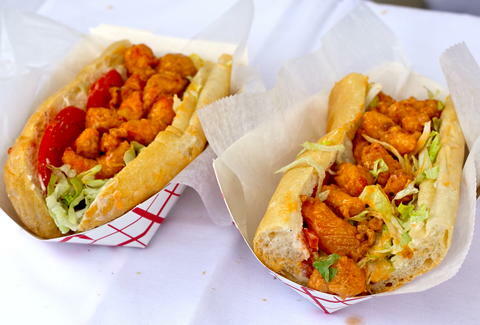 The delectable staple of true New Orleanians (alongside daiquiris and crawfish) is back on display Oct 23rd for the 10th Annual Oak Street Po-Boy Festival. Whether your jam is alligator, shrimp, brisket, or mac & cheese, this year brings back old favorites and introduces new creations. Check out these highlights and contenders for this year’s festival honors. Last year’s Best Crab po-boy winner is back. This time, it'll serve up crab fried with homemade seasoned tempura batter, and dressed with lettuce, tomato, and pink sauce (otherwise known as Japanese seasoned mayonnaise.) 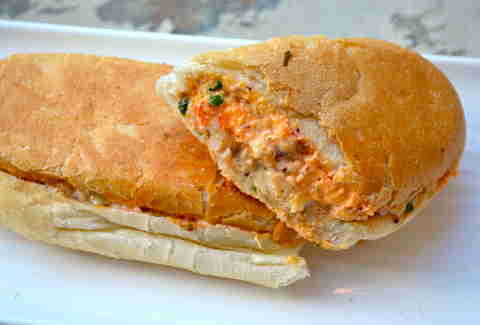 All of the Ajun Cajun po-boys will be served on toasted Dong Phuong bread for $11. This repeat favorite previously won the Best Pork award and is one of Bratz Y’all’s most popular Po-Boy Fest menu items. Created by chef Sven Vorkauf -- a transplant to New Orleans from Berlin, Germany -- the Drunk Pig is stuffed with slow-roasted pork that’s been marinated in dark beer and topped with mustard, sauerkraut, and caramelized onions for $9. This one just begs for a beer, German obviously, to go with it. It’s not a New Orleans festival unless there’s alligator on a plate. 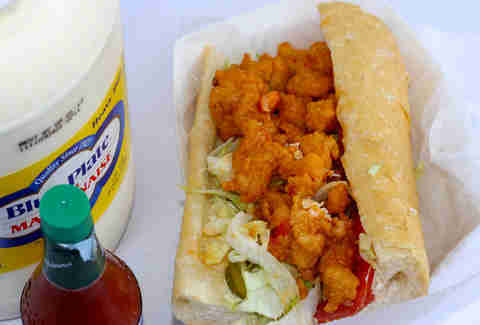 This $9 po-boy comes courtesy of Miss Linda, who blends Asian fusion and Cajun home cooking. 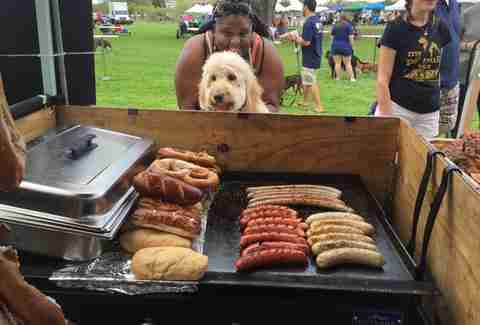 She will also be cooking up a beef ya-ka-mein for $7, and a shrimp & beef ya-ka-mein for $8. This will be the second year for the Chef Guevara Cuban -- Cuba Libré-marinated pork shoulder, shaved Chisesi's ham tossed in rum molasses vinegar, pickled mirlitons, Swiss cheese, and NOLA Hopitoulas mustard served on Leidenheimer's bread. The po-boy is the brainchild of chefs Tory McPhail of Commander's Palace, Jared Ralls of La Boca and Primitivo, Chris Montero of Napoleon House, and Mike Brewer of Elements, who united to create Silence of Da Hams for Hogs for the Cause, a BBQ fest that raises money for pediatric brain cancer. At $8 a pop, order a few for a substantial donation (and taste to boot). Owner Simone Reggie admits to being excited and “a little nervous” ahead of her Po-Boy Festival debut. The fest will also be the city’s first taste of Simone’s Market, which is due to open on Oak St this fall. The chicken thighs will first be smoked, then fried and served with homemade slaw and pickled peppers for $8. 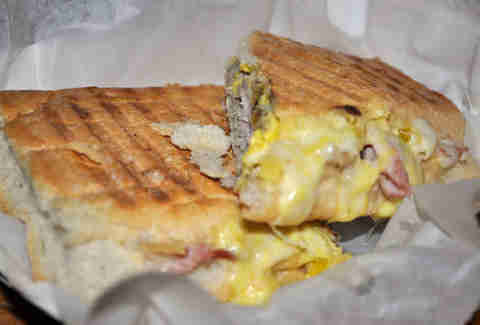 This cheesy deliciousness is another new entry at this year’s fest. Crab spiced and boiled Gulf shrimp will be mixed with creole cream cheese, grated cheddar cheese, and roasted jalapeño aioli, then served between two pieces of pressed Leidenheimer's bread for $8. This lobster po-boy -– we should say “lob-stah” since it’s sourced from Maine -- has been a fan favorite since the first Po-Boy Festival. Served with Crystal Hot Sauce, this $11 po-boy has been named a Best in Show winner, and its creators hope to reclaim its title. Sarah Netter is a journalist and TV producer who lives in New Orleans with her young son and two neurotic dogs. Find her in line for a drive-through daiquiri at @SarahMNetter.